Some WordPress users know and use every feature of the application, while others stick to the few they know, missing out on potentially useful features because they either didn’t realize these features existed or they didn’t know how they worked. 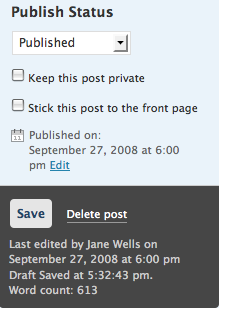 One feature that falls into this category is the ability to schedule the publication date/time of posts. This feature can be used to write something in advance that you want to publish later, or to write something belatedly and have it appear as if you’d written it sooner. For example, I might write a post about something like the release of 2.7 in November before it actually happens so that I can take my time writing the post and have it ready to go live when 2.7 officially releases. I can schedule the publish time for November 10th at whatever time the release is due to go out, and my post will remain unpublished until that time. If I’m on a plane or in a car or otherwise not online when 2.7 is released, my post will still go live at the time I scheduled it. Yay! Inversely, sometimes you might not have time to write something until after the fact, but you want it to be timestamped with an earlier publication date/time. For example, I’ve known students who use this feature to post school assignments “by the due date” if they finish a few minutes or hours after a midnight deadline but before the professor checks the class blog in the morning. If you haven’t noticed or used this feature before, give it a try. When writing a new post, just above the Save and Publish buttons there is a small calendar icon and the words “Publish Immediately” followed by an “Edit” link. Clicking on the link will make the timestamp editable. Just change the date and/or time and click the OK button. If you choose a time in the future and then click on Publish, that’s when the post will go live. If you click Save, the post will remain a draft until you Publish it, regardless of the edited timestamp. If you choose a time in the past and click Publish, go check out your archives and you’ll find the post as if it had been there all along. Cool, right? Now that you know how it works and how you can use it, maybe you can help us figure out how we can make this feature more obvious to new users, and what to call it. We’re spiffing up the Publish module on the Write screen, and are trying to find the right words for this feature, since so many people miss it currently. A couple of developers and I went back and forth the other day suggesting different labels to try and make it clear (without taking up a lot of space) not only that you can schedule the publish time, but that you can edit the timestamp after a post has already been published. We came up with a few ideas, but thought this would be a good opportunity to get community input. 1. Did you know about this feature? 2. Do you currently use this feature? October 1, 2008 Update: The survey is now closed. Thanks to all those who participated.